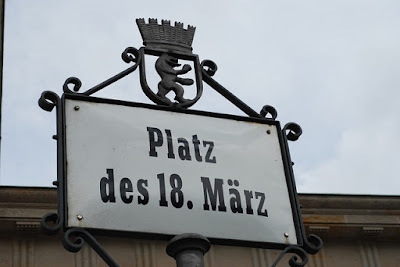 “March 18th Plaza,” in Berlin. Historically, German and English came from the same language family. In fact, English is considered a “Germanic” language (click here for a language map and here for a cool graphic with more information). That means that many common words are similar in both languages. Some quick, easy examples are house/Haus, man/Mann, here/hier, and good/gut. If you have a high level of vocabulary in English, you can also notice other similarities between the two languages. For example, the German word for “dog” is “Hund.” That looks pretty different, but if you know that “hound” is another English word for “dog,” then you can see the similarity. Similarly, “chair” is “Stuhl” in German; it looks very different, but it’s pronounced quite similarly to “stool,” a synonym for “chair.” There are many more examples. Another area where we notice both similarities and differences is grammar. In some ways, German grammar is horrible (trust me). Simply put, it’s much more complicated than English grammar. Still, if you know that a verb is irregular in English, it’s almost always irregular in German, too. For example, the English verb “to swim” is conjugated swim – swam – swum; in German, it’s schwimmen – schwamm – geschwommen. That’s obviously not exactly the same, but if you compare it to a Romance language like Spanish (nadar – nadé – nadado), then you can see English is quite a bit closer to German than Spanish. Before we look at the differences, I wanted to recommend a semi-famous article by Mark Twain called “The Awful German Language.” It’s a classic among German students, but even if you don’t study German, it’s pretty funny, and you can hopefully read it to appreciate the German language–while laughing a bit, also! As you probably noticed, “vocabulary” was in the “similarities” category, too. That’s because there are some similar words between English and German, but there are also many different words, as well as different word-forming patterns. As you can see in the picture above, German can sometimes have very long compound nouns. Some can get ridiculously long. Here’s a fun one, since yesterday was Independence Day in the U.S.: Unabhängigkeitserklärung (“independence declaration”). Speaking of nouns, another characteristic of German is that the first letter in a noun is always capitalized; that’s why Hund, Stuhl, and Unabhängigkeitserklärung are all written with a capital letter. Another difference is definite and indefinite articles. 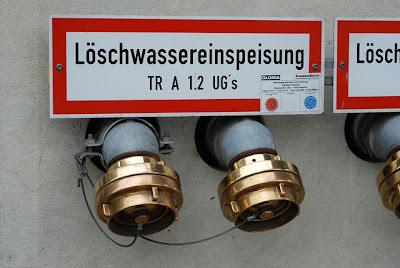 These exist in English, but they’re more complicated in German. The English definite article is “the,” and the indefinite article is “a” or “an.” But in German, the definite article can be der if the word is masculine, die if it’s feminine, or das if it’s “neuter.” For example, Stuhl is masculine–don’t ask me why, though!–so it’s technically “der Stuhl,” if the word is the subject of a sentence. If it’s an object, it changes to den Stuhl. And it changes again if it’s an indirect object and again if it’s possessive. And that’s just for the definite articles–the indefinite articles are a whole other problem! To make a long story short, there are between 6 and 12 ways to say the word “the” (depending on how you count). And adjectives are even worse. You’re probably thinking, “Wow, that’s horrible! Aren’t there any good differences between German and English?” Yes, there is at least one area where German is generally considered easier than English: Pronunciation. English pronunciation is notoriously difficult to master, but German is much more phonetic, and if you can figure out how to read some of those ridiculously long words, you can also probably pronounce them without too many problems. German does have a few different sounds and letters (Ö, Ü, and Ä, plus the ß, which is basically the same as “ss”), but once you learn what they sound like, they always sound the same way, which is convenient. Then you just need to work on accent reduction! So, I think that’s all for now. I could talk a long time about all this stuff, so I hope it was interesting for anyone who’s made it this far. I also hope I’ve not scared you away from German forever! It’s difficult, but also sort of fun if you learn it with the right attitude. If you’ve got any questions about English, German, or anything else, please feel free to say hi in the comments section or contact me. Thanks for your comment, and I’m glad the post could be of help to you! Also, thanks for the correction; you’re completely correct, since “das” is the neuter definite article and the plural definite article is “die.” I’m not sure what happened there, but as you can see I posted it pretty late at night, and I guess that one just slipped on through…Correction made. Thanks again, and good luck with your essay! English and German appear nearly as dizygotic twins to me, although there is one funny example in which they differ a lot: the English ‘th’ and the German ‘ä,ö,ü’.